Grant Green (June 6, 1935 – January 31, 1979; some sources erroneously give the birth year as 1931) was a jazz guitarist and composer.Recording prolifically and almost exclusively for Blue Note Records (as both leader and sideman) Green performed well in hard bop, soul jazz, bebop and latin-tinged settings throughout his career. Critics Michael Erlewine and Ron Wynn write, "A severely underrated player during his lifetime, Grant Green is one of the great unsung heroes of jazz guitar ... Green's playing is immediately recognizable -- perhaps more than any other guitarist." Critic Dave Hunter described his sound as "lithe, loose, slightly bluesy and righteously groovy". He often performed in an Organ trio, a small group with an organ and drummer. Green was born on June 6, 1935 in St. Louis, MO. He first performed in a professional setting at the age of 12. His influences were Charlie Christian, Charlie Parker, Ike Quebec, Lester Young, Jimmy Raney, Jimmy Smith and Miles Davis, he first played boogie-woogie before moving on to jazz. His first recordings in St. Louis were with tenor saxophonist Jimmy Forrest for the Delmark label. The drummer in the band was Elvin Jones, later the powerhouse behind John Coltrane. Grant recorded with Elvin again in the early Sixties. Lou Donaldson discovered Grant playing in a bar in St. Louis. After touring together with Donaldson, Grant arrived in New York around 1959-60. Lou Donaldson introduced Grant to Alfred Lion of Blue Note Records. Lion was so impressed with Grant that, rather than testing Grant as a sideman, as was the usual Blue Note practice, Lion arranged for him to record as a bandleader first. Green's initial recording session went unreleased until 2001, however, owing to a lack of confidence on Green's behalf. 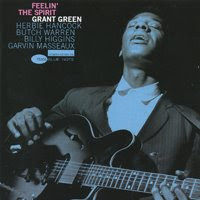 Despite the shelving of his first session, Green's recording relationship with Lion and Blue Note was to last, with a few exceptions, throughout the Sixties. From 1961 to 1965, Grant made more appearances on Blue Note LPs, as leader or sideman, than anyone else. Grant's first issued album as a leader was Grant's First Stand. This was followed in the same year by Green Street and Grantstand. He often provided support to many of other great musicians on Blue Note. These included saxophonists Hank Mobley, Ike Quebec, Stanley Turrentine and Harold Vick, as well as organist Larry Young. Grant was named best new star in the Down Beat critics' poll, 1962. As a result, his influence spread wider than New York. Sunday Mornin' , The Latin Bit and Feelin' the Spirit are all loose concept albums, each taking a musical theme or style: Gospel, Latin and spirituals respectively. Grant always carried off his more commercial dates with artistic success during this period. Idle Moments (1963), featuring Joe Henderson and Bobby Hutcherson, and Solid (1964), featuring the Coltrane rhythm section, are acclaimed as two of Grant's best recordings. Many of Grant's recordings were not released during his lifetime. These include Matador, in which Grant is once again in the heavyweight company of the Coltrane rhythm section, and a series of sessions with pianist Sonny Clark. In 1966 Grant left Blue Note and recorded for several other labels, including Verve. From 1967 to 1969 Grant was, for the most part, inactive due to personal problems and the effects of heroin addiction. In 1969 Grant returned with a new funk-influenced band. His recordings from this period include the commercially successful Green is Beautiful and the soundtrack to the film The Final Comedown. Grant left Blue Note again in 1974 and the subsequent recordings he made with other labels are usually described as "commercial". Grant spent much of 1978 in hospital and, against the advice of doctors, went back on the road to earn some money. While in New York to play an engagement at George Benson's Breezin' Lounge, Grant collapsed in his car of a heart attack in New York City on January 31, 1979. He was buried in Greenwood Cemetery in his hometown of St. Louis, Missouri, and was survived by six children.